The average Marathon runner will burn between 2900 and 3500 calories as they negotiate the 26.2 mile Virgin London Marathon course on this weekend. With energy levels low, runners will need to recharge their batteries with a lunch of champions. Or in my case, it’ll be a dinner of champions as I’m so slow! To help replenish their depleted fuel tanks, the Royal China Group will be offering competitors a free dim sum dish, when dining in one of their six London restaurants on the day of the Marathon. Diners simply need to present their Marathon medal to a member of staff on arrival at the restaurant. 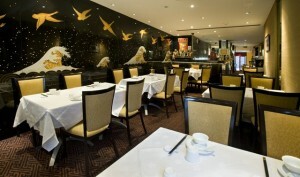 The Royal China Group consists of six of London’s most authentic and prestigious Chinese restaurants, including the luxurious and critically-acclaimed Royal China Club. Based in prime areas of London, the restaurants are centrally located on Baker Street, as well as in Bayswater, Fulham, Harrow-on- the-Hill and Canary Wharf. #RunSquibbRun Dinner & Dance Total!